Yes, you read that correctly. 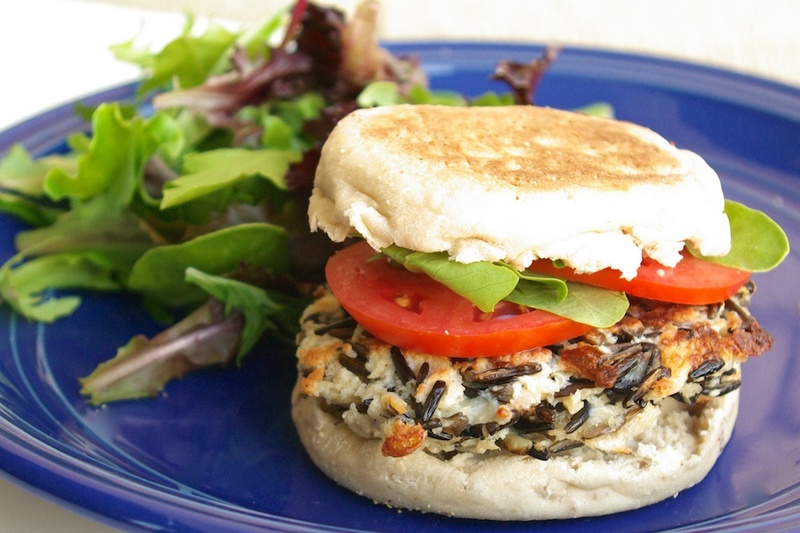 These burgers are made from wild rice and baby portabella mushrooms, and they are incredible! Though I currently live in Massachusetts, I am a Minnesotan through and through, so I am always looking for new ways to cook with wild rice: that delicious, nutty grain grown in the many lakes of Minnesota. From soups and casseroles to side dishes and breads, this flavorful grain is a wonderful, hearty addition to any dinner table. Today I decided to make wild rice the star of the meal by forming it into patties and making a burger, and I must say, I am very pleased with the results! The warm, nutty flavors of the wild rice combine perfectly with the meaty, earthy, baby portabellas, while the sharp cheddar, garlic, and seasonings tie everything together. If you’re looking for a new twist on a burger, I’ve got you covered! Paula’s Notes: When forming the patties, don’t get nervous; they don’t stick together as easily as a beef or turkey burgers, but that’s okay! Gently press them into a patty in the palm of your hands, and then place them into a preheated greased skillet. Then, simply add a bit more wild rice mixture to the patty, until it reaches the size you want, and pat down lightly. The cheese and the egg act as binders once they hit the hot skillet, so when you flip the patties over, they will hold together. Heat 1 tbls. oil in a nonstick skillet over medium-high heat. Add onions and mushrooms and saute until tender, about 5-8 minutes. Add garlic for the last minute of cook time. Remove from heat. In a medium bowl combine wild rice, 1/2 cup cheese, bread crumbs, seasoning, and mushroom mixture. Stir to combine. Add in eggs and stir until fully incorporated. Preheat remaining tbls. of olive oil in a large nonstick skillet over medium heat. Gently form mixture into patties and place in skillet. If you have trouble with the mixture sticking, see note above. Cook patties until browned on one side, about 3-4 minutes. Gently flip and cook on other side until done. As second side cooks, top burgers with remaining cheddar cheese. Serve burgers atop hamburger buns and decorate with favorite toppings. These look really good. I've been wanting to make some homemade veggie burgers for a while. Do you think I could use regular mushrooms?